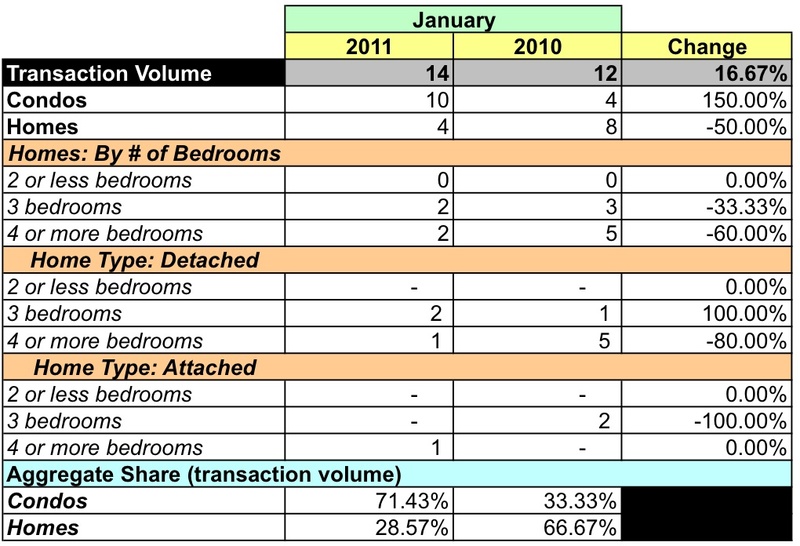 In this post, I look at January sales recorded for DC zip code 20015 using data released by MRIS. That zip code is roughly bordered by Western Avenue NW down to River Road NW on the west, Oregon Avenue NW / Rock Creek Park on the east, and Harrison Street NW / Nevada Avenue NW on the south. Generally speaking, it includes the Friendship Heights, Barnaby Woods, and Chevy Chase DC neighborhoods. Deer from Rock Creek Park can be seen munching on shrubbery in the neighborhood. YoY, aggregate dollar volume fell 11.6% and the number of units sold rose 16.67%. The aggregate average sales price dropped 24.23% and the median sales price was 38.45% lower. Condos ruled 20015's housing market in January, accounting for 10 of the 14 units sold. The number of condos sold in January 2011 was more than double that of January 2010. The average price for a condo was up slightly more than a quarter, up 26.64%. 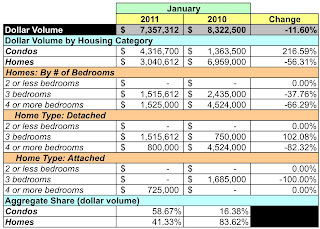 Unit sales for homes were half that of January 2010 and dollar volume was down 56.31%. Average prices were 12.61% lower. Nothing sold for more than $1MM: 3 of the four homes sold for prices between $600 - $799K, one sold for $800-$999K; eight of the ten condos sold for $300-499K. In January, zip code 20015 represented 4.06% of DC's dollar volume and 3.67% of unit sales. In comparison to the District as a whole, its average price was 10.31% higher and its median price was 19.21% higher. Despite the low sales volume, at January's sales rate there's just slightly more than one month supply of condos and 5.5 months supply for houses listed in 20015. Right now it's a seller's market. To reinforce that point, MRIS records that January's sales were at 99.94% of list price. In other words, homes were selling at the asking price. Since 2007, with the exception of January 2008, about 14 homes have sold each January. When you look at the MRIS data, 20015's overall January 2011 sales activity [contracts closed, homes under contract, homes with contingent contracts] is not only the highest since January 2007, it's double that month's total sales activity. 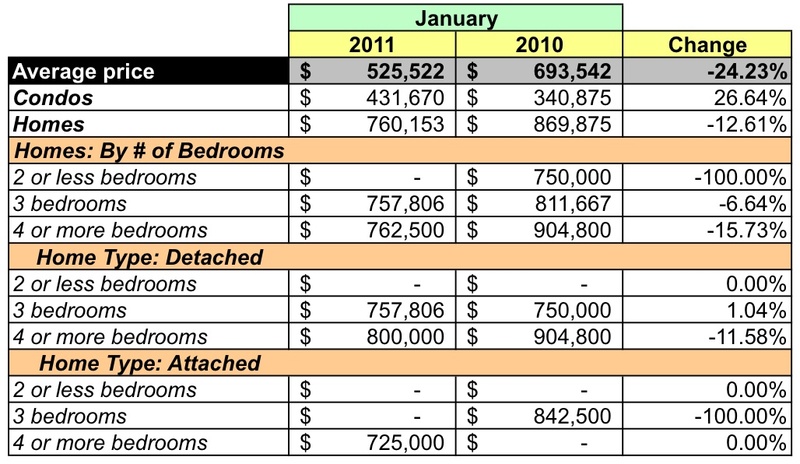 I think the differing sales mixes in January 2010/2011 explain many of the metrics (lower dollar volume, lower average sales price, lower median price) we see in January 2011. 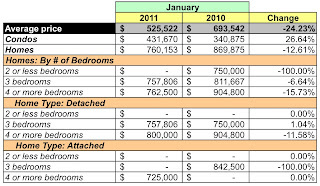 About 2/3 of sales in January 2010 were homes while in January 2011 lower priced condos represented 71% of units sold. MRIS doesn't provide insight into the types of units that went under contract in January, but of the 33 that were listed, 22 are homes and of those, 10 were listed at $1-2.49MM. So we have a zip code where homes are selling at list, inventory is tight, and higher priced units dominate new offerings on the market. For those who want to purchase a home in 20015's neighborhoods and can afford to do so, I would say be prepared to move fast and to offer full price or more.